Looking for camping hiking tips? Free Appalachian Trail maps are a great resource to have when planning a hike along the famous trail. The Appalachian National Scenic Trail is a marked hiking trail in the eastern United States, which extends from Springer Mountain in Georgia to Mount Katahdin in Maine. More than two thousand miles long, it is one of the longest trails in the United States. This famous hiking trail is maintained by numerous organizations and clubs along the way. 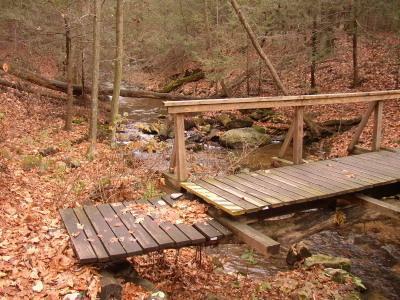 Much of the Appalachian Trail is wilderness although some parts of it do cross towns and roads. The trail passes through the states of Georgia, North Carolina, Tennessee, Virginia, West Virginia, Maryland, Pennsylvania, New Jersey, New York, Connecticut, Massachusetts, Vermont, New Hampshire, and Maine. It has been rumored to also be a major route through bigfoot country. There are several places to find maps of the Appalachian Trail on the Internet. These may be printed off and used as needed. Downloadable GPS Map at Guy Mott- This GPS map includes shelter waypoints, connected as route points. Appalachian Trail Conservancy-Another GPS downloadable map that has some of the most up to date and accurate information available. National Parks Sevice maps-This is divided into five parts, and each is a large graphic file. These are excellent maps, however, and can be a good resource. Gorp Resources - This tool provides an excellent overview of the Appalachian Trail and the various resources that are available to help with planning a hike along it. Destination 360 Map- A full color, full length map of the trail that can be printed. Backpacker Magazine-This is one of the best interactive maps on the Web with tips, reader photos and videos. New Jersey- A trail map of the trail as it passes through New Jersey with details about some short hikes that can be taken along the trail itself for those that don't wish to do the whole thing. Internet Access Along the Trail- Planning on blogging your adventures? This is an internet map of places along the trail where Internet access is available. Besides free Appalachian Trail maps you will want to read up on the unique situations, weather, and potential dangers that you will encounter along the trail. Several hiking sites have information that can assist both the experienced and inexperienced hiker. White Blaze-Advice, gear, tips, packing lists, maps, and more from people who have hiked the trail all the way through. Hiking the Appalachian Trail- An article about the experiences of the author who hiked all the way up the Trail. Mississippi River and Appalachian Trail blog- A blog with lots of information about the Trail. This informative site includes videos, images, and links. Appalachian Trail Homepage- Links and information to help anyone prepare to hike the Appalachian Trail. Whether you are hiking the whole trail or only a part of it, free Appalachian Trail maps are an important item to take with you. Spend time before the actual hike studying the maps and plotting your course. Take into account the distance between towns, and checkpoints and plan your supplies accordingly. Preparation and research will ensure that you have a safe hike.